When morning sickness hits you, you need something to get rid of the nausea, and you want something that works fast. Otherwise, your stomach will take care of that for you, and you’ll toss your cookies. 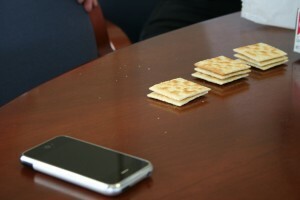 Saltines or soda crackers. Pregnant women have sworn by these for years. Keep some on your night stand, take a few packets in your purse, and make sure you have them on hand at all times. Ginger ale. No expectant mother’s refrigerator should be without some. You may want to keep a bottle by the bedside as well. Alternately, anything with ginger in it (ginger snaps, ginger powder, or even fresh ginger) can help relieve the nausea of morning sickness. Acupressure. It sounds odd, but it works for a lot of women. Place your first three fingers from one hand at the center of the inside crack of your wrist on the other hand. Apply pressure for two or three minutes, and the nausea will generally subside. You can even do this preemptively if you know the times that you generally have morning sickness. Mint. Both peppermint and spearmint work wonders for nausea. Most of us don’t have mint leaves lying around (chew them, if you do), but chewing mint gum or inhaling a few drops of peppermint or spearmint oil does the trick, too. Aromatherapy. Try using aromatherapy candles or diffusers. You can even use these while you sleep to prevent morning sickness when you wake up. If you don’t have these, a few drops of essential oils (peppermint, spearmint, lavender, chamomile, and ginger are all good choices) in a vaporizer will do the same thing. If you experience morning sickness that is so severe that you can’t keep food down longer than a day, or if you are losing weight while you are pregnant, let your doctor know. In most cases, doctors will recommend that you use natural remedies when you can, but they also have medications at their disposal which can help if natural remedies aren’t helping with extreme morning sickness.